Ellie and Bella are a perfect fit for the American Pale Ale label. Though both models hail from places outside Montana- Bella from Colombia and Ellie from Minnesota- both made their way to Montana and were forever changed. They both also pair their endearing personalities with a beautiful finish. Though Bella was actually born in Colombia, she has been an American since the age of two, and now she bleeds red, white and blue. Though she retains her Colombian roots, she has spent her formative years running and playing in the rugged mountains of Montana. Ellie was originally from Duluth, Minnesota before she made her way to Montana. Both Ellie and Bella share an affection for backpacking and getting out into the wilds. If they were to be Ninja Turtles, both would be Michelangelo due to their chill demeanor and mutual love of pizza. "I'm a sucker for a good gin and ginger." 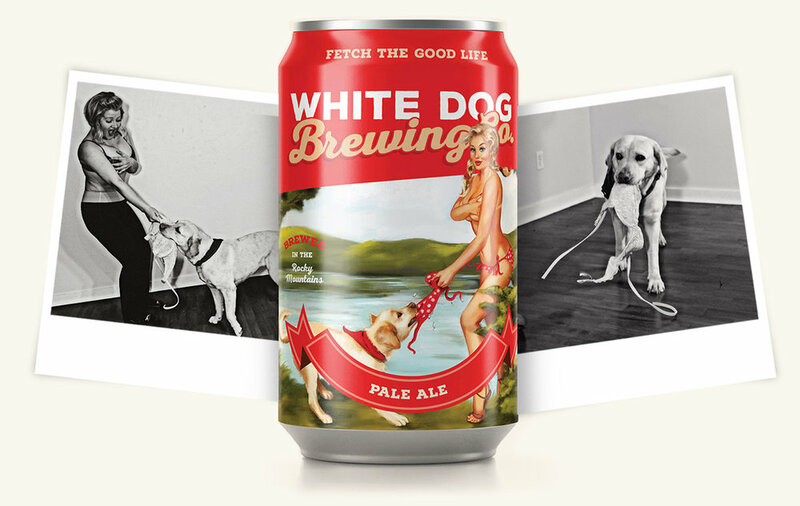 White Dog Blonde. So drinkable!! I can whistle like a train. Would you rather be a great white shark or a grizzly bear? Why? Grizzly Bear. Party all summer, slumber all winter! Her idol is 19th century Russian novelist Ivan Turgenev. I don't care for his writing, but she quotes it often. Bella's favorite snack is anything you drop on the floor. She's particular about cereal, yogurt and pickled ginger, but will take anything you are careless enough about to drop. But don't your DARE put it on a plate. It has to be off the ground. Her favorite toy is a tie between her weird profile cut stuffed moose, a gift from one of her bffs and the snake toy she got as compensation for her model shoot. Once we told her to pretend it was a bra she was pulling, she never wanted to let it go. Bella does this weird thing where she likes to place her head against wet grass and run. It's like her impression of a canine farming plow. She does the same thing when she is in shallow water, but we call that "submarine-ing". Naughtiest thing she's ever done? In the span of a week she ate: 2 pairs of my favorite shoes, my drivers license, an Xbox controller, my reading glasses and exploded a pen on the couch. But that was when she was still a pup. She doesn't do that anymore.